For the city-loving Dark Elf, there's no better choice of residence than the Saint Delyn Penthouse in the heart of Vivec City, on the Waistworks level of the Saint Delyn canton. Saint Delyn Penthouse is a player room in Vivec City. It is located in the Abbey of St. Delyn on the Waistworks level of the Canton of St. Delyn the Wise. 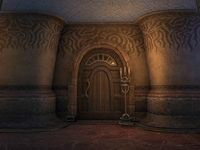 The room can be obtained for free by completing Room to Spare with a character created after purchasing The Elder Scrolls Online: Morrowind. Note that you must start this quest in Vivec City. If you start the quest in your Alliance's zone, you will earn the inn room there instead (even if you already have it from another character). It can also be purchased outright for a nominal fee.